Walking through Lospalos during the lunch and siesta hours gives an exaggerated impression of the town’s sleepiness. My friend Adam is still with me and we navigate the three un-edged streets from the guesthouse to the Co-op. My fear is present, but sedated heavily by Adam’s presence. Walking this road without him tomorrow will be a different experience. We pass the statue, which flags a deserted main street. Even the street dogs seem to be moving slowly and minimally back to life after their lunchtime rest. One by one, people emerge from shelters and houses and note the Malae walking through. Some call out ‘Botardi’ and I call back, sometimes stern and defensive, calculating the intent behind the greeting, sometimes warm and relieved when the word is accompanied with a genuine, gummy smile from an orange toothed Tia. I appreciate the pronunciation practice, and verbal recognition releases the wary tension held in a stare. I am unsure which house is the correct one. We only saw it in the dark last night and even in the daylight, only it’s position on a bend in the road distinguishes the co-op from the other plain fronted dwellings, with low brick walls, tiled verandahs and rusting corrugated roofs’ stooping low toward the rising grass and weeds. We hear a welcoming holler from inside before we can see the open smile accompanying it from a beaming Amelia. I can hear the gentle rumble of Gabi’s Australian voice, instantly familiar to my ears. As if she projects from a different part of her jaw. Holds her tongue at a lower tension. Speaks from further forward in her mouth. It’s immediately recognizable in a chorus of highly-strung vowels that soar high and then swoop quickly into rounded consonants. Soon we are inside the dull shade of the heavily wallpapered room. We meet a broad-smiled Ilda and a wide-eyed and polite Donna, then Aquita whose gentle reserved nature matches my own trepidation. Gabi translates welcomes and hellos. We all have so much to say but cannot and so our smiles crash into the silence where our language fails us. We unburden ourselves of the carried patterns and posters, books and bundle of fabrics we have brought from Dili. Three laminated desks in the center of the room and a whiteboard in front form a boardroom vibe but the concrete floor and untreated wooden doorjambs remind us why we are here. The hot light from outside is quickly swallowed and the air inside is cool and damp. The room to the left is painted all white- seeming stark compared to the patterned walls where we are standing. The blankness of the walls allows the Tais to rise to the challenge of catching our already over stimulated attention. On a table, also clothed in white, are folds and folds of Tais, different widths and tassels and each ones heavy, even texture cries to my fingers to explore it. Through the back is the sewing room where an old singer proudly sits by the back entrance where the light reflects off its olive coloured arm in a muscular curve, ballooning like a bicep with the weight of its importance. One wall is lined with desks, piled high with off cuts and linings- ever encroaching on the workspace where scissors lay among threads next to a rotary iron, lying on its side to cool. The third wall is home to a family of bags, hanging like jewels from shiny hooks. My impression is split like a rock between being full of awe at the women’s capacity to produce anything like this and the remaining climb they must make before they reach the summit of their realized perfection. I curse myself for being in a profession that must always be critical, must always focus on what is wrong. These bags are a wonderful achievement, but what I am grieving is that gap between what they are and what they could be, what could earn the products the prestige they deserve and the women the money they need! The problem lies far from the product and closer to the perception thereof. For now though, we will simply strive to achieve a better result. On my first day of work the ladies are running training sessions for representative members from other groups. I sit listening (over the sound of impossibly heavy rain) and watching in awe as the ladies list and explain each of the quality standards that the Tais must meet in order to pass quality control and be accepted by the partners who will sell them in Dili. While impressed at the depth of analysis that has been communicated my eye keeps flickering back to that white room, to those shiny hooks holding the precious cargo. Locally grown, naturally dyed, hand spun, skillfully woven in poor light while child minding, then lovingly cut and sewn. In my mind; masterpieces. However these products are sewn from Tais that have not followed the brief. Stripes too wide, weft to wavy, too long or wide. As painstakingly beautiful as each one is, they are not what was ordered. The training sessions will hopefully allow the groups of weavers to understand the importance of delivering product as it was ordered. For Tais, this is a must. The amount of time, skill and valuable physical resources being used on unsellable product is high as well as heartbreaking. This training is paramount. Outside the rain has not stopped and the back of the co-op has become a river. Children squeal and play in the floodwater, their nimble feet finding familiar ground beneath the current and our neighbor takes the opportunity to wash his car. I watch Aquita cut Tais freehand and deftly sew a wallet within the afternoon, swiftly winning my respect and admiration as a masterful sample machinist. When I look at the Tais she is using, all I see is the overarching beauty of a traditional skill. Wavy lines are a part of their inherent nature, reminding me of the tough conditions under which they were woven. Colours that are a shade off what was ordered are in a realm of their own beauty. Is a natural world of varied colours and organic lines not more appealing than a precise, clinical edge? In my short experience and limited understanding, perhaps naively, I feel that the problem lies in the perception rather than the product. During my time here I will try to bridge a gap that I wish did not need closing. There is always room in this world for creativity; we must merely set up the meeting place for ingenuity and appreciation! We have decided that a request from Hotel Timor for Aprons and headbands should be prioritized within the list of products we hope to develop during my stay. As is so often the case, the best way forward is to dive in and let the experimentation begin. We find some old sheets in a box of donated fabrics and get to work on a pattern for our first sample apron. My Tetun has not come very far in my first week, but the communication opens up when Aquita and I realize that we share the universal language of patternmaking! I merely make marks on paper, or demonstrate folds and Aquita’s face lights up in understanding of the mitered corner or bagged out facing it will achieve. I sit with her as she sews and together we agree wordlessly on which step is to come next. By home time of the same afternoon, we have a finished sample, which all the ladies approve of. The next day we have a half apron (for male staff) and a headband. The progress is overwhelming and the process is logical. On an afternoon when Aquita is not in, Amelia takes the opportunity to show me her necklaces. Amelia has a passion for jewelry making and is suffering at the hands of the same hurdle felt by designers worldwide-refining a technique to create a finished product. 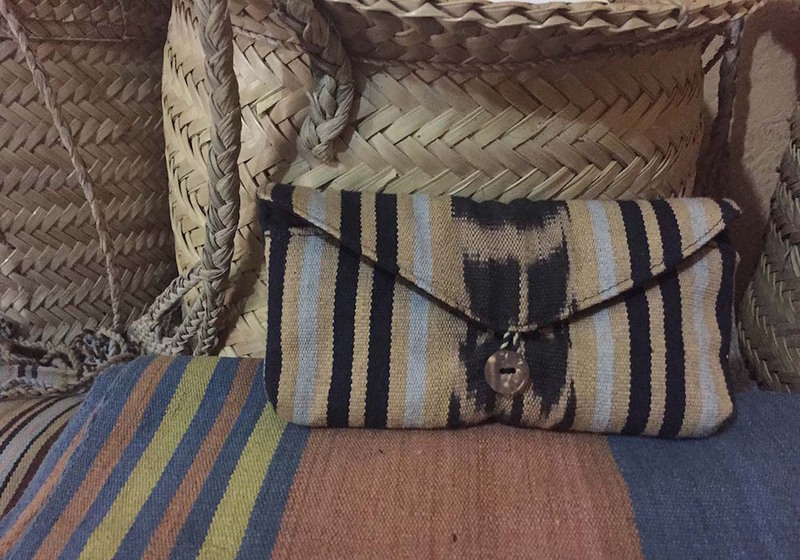 The hand-netted stone slings she wants to make are once again, made from the natural dyed kabas from Iliomar. The stones are collected from around the town, beautifully smoothed and rounded by the earth. Amelia carefully knots the cotton, separates the strands, and then re-knots each section methodically. My attempt to mimic her is clumsy and childlike. I feel like the chubby handed younger sibling who’s under developed dexterity refuses to comply with their overdeveloped imaginings. Once I have seen the process, I make some suggestions about the finish at the top and the bottom of the stone. Tassels on one, two stones hanging from one pendant, a loop from which they can fall. Amelia adds the twisting technique they use to make the tassels on the Tais; within the afternoon she has completed several perfectly finished samples. The weightlessness of a long awaited design solution pours from her smile, the talent is all hers and she is thrilled with her ability to now play with the designs. I did not show her this. I could not make theses with my own hands, I merely suggested and tried and gave her the freedom to play. The joy of making is visible in Amelia and over the next few days she is drawn to the jewelry table with a magnetism that was previously stifled. On the Monday of my third week in Lospalos, Amelia must visit some of the local Co-op members while they set up the looms for an order. I am invited along and jump ate the opportunity to see the weavers. At the first house we are greeted by 1, 2 up to 10 women appearing from neighboring houses…some toothless some cautious, but all welcoming. They hold my hand and press their cheeks to mine; a gesture that is a customary greeting but feels very much like an intimate and personal welcome. One lady sits at the base of the loom and one lady sits inside the large (bed sized) frame and they pass balls of cotton between them wrapping them expertly over and under the bars at each end. Amelia measures the space between the bars and, as they change cotton colours, she measures the widths of the stripes they have set up. Some sections require two colours of cotton wound onto the frame at once (set up for Futus design) and some are just one colour plain striped sections. It is mesmerizing watching the hands pass lithely back and forth, slowly closing the space between the frames edges. While my eyes are locked on the cotton, my ears take in the pitchy warble of an impossibly tiny bodied but hearty voiced Tia Juliana telling what sound like incredibly animated stories in Makalero. Her words are greeted with replies that raise laughter or scoffing from the other ladies. Although I cannot understand Juliana’s words, her energy is easy to read; charismatic, enigmatic and respected. The shade is heavy and still beneath the corrugated iron shelter. The brilliance of the sunshine beyond its edges lights up the verdant grass and muddy stones and washes the scene in dazzling yellow. The voices dance through drying washing, past squawking chickens and become lost in the closely scattered houses and pathways beyond them. On a desperately exhausting afternoon in Dili, Gabi and I find ourselves in an over-heated, over-crowded Loja Timor Diak (Sewing store). Through a fug of heat, delirium and exhaustion we try to assess what the co-op will need and walk away with a packet of wadding and some coconut buttons. The following week Aquita and I have achieved a finished, refined, well-proportioned glasses case (“fatin oklu”) making use of these materials. This is another item that has been requested and may lead to a large order. This is the fourth sample of the product that we have experimented with and the ladies are becoming quite comfortable with the sampling process, seeing that trying is not a waste if it leads to a good product that can be reproduced. With Gabi’s departure due to illness I am alone with the ladies for a while and on Tuesday morning they inform me that Timor adventures are coming this afternoon! Carlos (who I met with Gabi in Dili) is bringing 4 Australians through and they want to come and see what the co-op does. Dona just casually says “you can talk to them in English” and it definitely has the inflection of a question but also carries a certain bluntness of instruction. I really have no idea what to expect until members of the co-op begin turning up. It becomes clear that they are not here to drop off work, but are here to meet the group. Chairs are passed through and set up on our little verandah and I have that delightfully stressful feeling of having no idea what is going on, but I am not in charge so it’s ok. I just make sure all the older ladies are seated and continue working until a couple of Policemen turn up in the front yard. Dona does not seem bothered, and all appears routine. It is a fascinating world to live in, with never a clue of what is happening around you. From behind the policemen, appear Carlos and his four wards. Ilda and Dona disappear and return with a huge stone mortar and pestle. Olympia and Ana begin diligently crushing ginger, Tumeric, leaves, the bark from a Mango tree and just like that we are having a dying demonstration. They add water; add the kabas (cotton) and a few minutes later the now vibrantly coloured skeins are slung across bushes to dry in the sunshine. The tour group purchase many items from the Loja, from the pile of samples we have just sewn, from a bag of Tais that was supposed to be bound for Dili tomorrow. I have flashbacks to working Boxing Day sales at David Jones. Some of the items are not even priced yet. Someone has put coffee on but the tour group is headed to Jaco and keen to get back on the road! It is a whirlwind visit, but a successful one for the Co-op (lots of sales!) and a great demonstration for Carlos to see. We hope it will lead to more groups visiting. Next time we will ask them to allow more time so we can give each demonstration the focus it deserves. The members, the staff and I spend the afternoon drinking the coffee we had prepared for the guests and I once again am happily swallowed up by the rising and falling warble of indiscernible Makalero which splashes happily all around the workroom. Ilda has been in Dili for a few days now so in the mornings it is just Amelia and I in the quiet co-op. I am absorbed in our costing spreadsheet, numbers and cells floating before my eyes like a sheer curtain. Amelia timidly calls “desculpa” from the doorway and has a project she would like help with. She has applied glue to the edges of a small length of Tais, added buttons to one end and loops to the other to form a bracelet. This is a graduation from earlier experimentations with the tiny lengths of Tais used for bookmarks. We remind ourselves that we have agreed to try and not use the glue as the finish it gives is always poor. We remind ourselves that this does not mean a dead end and we head for the scrap basket. Finding tasseled ends to use for the loops and scraps of lining to use as backing, we sew instead of glue the edges. Our “primeru examplu” of a very attractive cuff is on its way. The last touch is the coconut buttons that Gabi and I bought on that fateful moment of enervation in Dili. Amelia and I delight in the easy progress that can be made in one auspicious hour of experimentation. The number of developed products grows and now we must turn our attention to getting orders for these items, or making more and ensuring people know they are available in our Loja. Talk of a sign for out the front of the Ko’opertiva has been ongoing but with little outcome. The talk of getting a camera so that the products can be photographed and sent to partners for viewing has also dwindled. Ilda is not confidant showing the samples to partners, as she believes her English will be a problem. It seems we have discovered our next challenge. Our routine at the co-op has settled into a comfortable step. In the mornings I complete work on the laptop like instructions sheets and colour charts. In the afternoons, I sit with Mana Aquita and we sew new products, or existing ones for orders. In a companionable silence, broken sometimes with jabs of my limited Tetun and fluent flurries of Aquita’s, we sit and we create. I have been photographing the making of each product step-by-step so that we will ‘La haluha” (not forget) what we have learned. 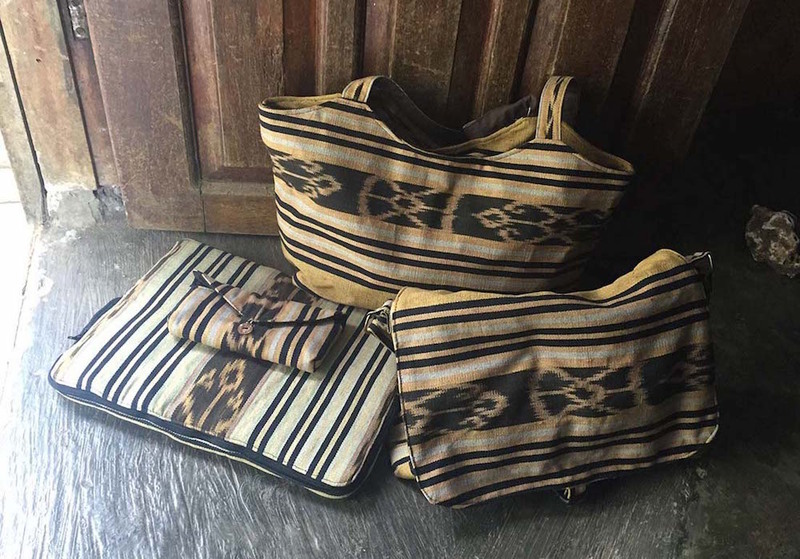 The Loja receives new items almost every day and is becoming a lovingly attended space with bags hanging from every free corner and purses lined up carefully like fruit at the market. A request for a Kindle Case sent the workroom into overdrive with Mana Aquita and Mana Ilda both whipping out designs. We didn’t actually have a kindle to physically check the size and so with much eagerness Aquita set about making a bigger case too. With much difficulty I finally managed to explain that kindles come in set sizes and must fit snuggly in the cases. We got hold of the kindle to test the fit and only had to adjust the pattern by a few millimeters. Samples were produced with different finishes including a tie, buttons or Velcro. The final design being quite simple and fast to sew, it is now a popular choice for the ladies to produce. On one afternoon the ladies were preparing cotton to take to the weavers for an order. This involves rolling small balls of the same colour together to make larger balls, as well as unraveling skeins of freshly dyed cotton and rolling them into balls. The term for this is “lolo kabas” and it bubbles from Ilda’s tongue with the same rhythmic motion of her hands wrapping the cotton around the stone at the center of each ball. As each ball grows the strands take different paths around the imperfect sphere forming a crosshatched globe of rich colour. I decide to try the more difficult task of rolling cotton from a skein onto a ball. A skein is a loosely bundled twist of many strands, full of slubs and imperfections and sometimes with strands still clumped together from the wet dye. Ilda slings two skeins around my knees and pulls one strand from each. I must hold the skeins taught with my knees and unravel the two strands simultaneously, winding them together around the small stone. As I pull the cotton, one snags on the other strands from the skein. I unravel it, then the other one snags. The other one appears knotted. Then one breaks. Ilda untangles and reties it. I repeat the process and complete one ball in about 2 hours, fumbling through many snags, catches and broken threads. I strain to keep my knees open and the skeins taught between them. I repeatedly sink into my lower back, which causes aches. Even my fingers are locked up from holding the ball tight between their tips. The sting of inexperience. Timor Adventures came back for another visit on a quiet afternoon, which enabled us to have quite a thorough presentation covering types of designs in the Tais as well as the dying process. That night I received a call from a company called Island Explorer Holidays, wanting to schedule another Tour Group visit the next day. In true “Tiny Timor” style, they had been in Jaco at the same time as the first group and exchanged information. The rise in tour groups and word of mouth has meant increased sales for the Loja. This not only creates a need for a constant flow of stock for the Loja, but also highlights and exciting avenue to generate sales. We have been discussing the possibility of having a “Tour Pack” to be brought out for visiting groups. Examples of dyed cotton skeins, rolled cotton, tied bundles of Futus cotton (dyed in sections, similar to tie dying) and of course a selection of the various roots, leaves and barks used for dying along with the colour document. Having this information ready means people can receive a good understanding of the skill that goes into dying, weaving and making all finished products. The ladies have already seen the value of a good presentation directly translating into good sales and are keen to expand on this. Interest from the tour groups in the Kor Natural lead me to expand on Kat’s work and put together a document on which colour comes from which plant. As they are not always plants that Malae would know of, we included information on what the plant looked like or what it was used for (i.e. edible fruit, leaves to make baskets etc.). The afternoon was full of misinterpretations and laughter as we acted out grinding plants, big trees, boiling wood, and soaking in mud. The document still has a little way to go (a few translations to revise and some more plant photographs required) but will offer tourists a reference to see where the colours come from in the Tais they are buying. In my final weeks at the Co-op it is time to distill what we have accomplished and ensure the ladies are competent and confident in their new designs and the new processes they have learned. This will allow them to continue designing new products and apply existing quality measures to all future products. Similarly, they will be able to calculate accurate costings for these products and hopefully generate an increase of Loja sales through signage and improved information for tour groups. Upon reflection my approach at the Co-op, while seemingly whirlwind, has been uncharacteristically gentle. A few sewing techniques were taught and a few designs were sampled to get things moving but ultimately, the entirety of the work accomplished during my stay here has been from the women’s own creativity, ingenuity and nimble fingered skill! In a country where dependence on NGO’s can be as big a problem as the initial need for assistance, Ko’opertiva LO’UD is a glistening oasis where it is proven that a little help can go a long way. Confidence in creativity is an important form of charity. 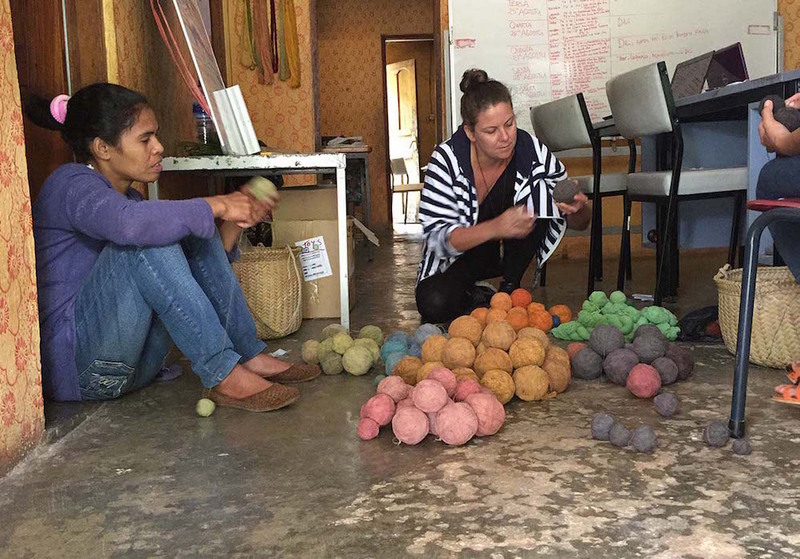 The ladies are highly talented, motivated, business minded and shine outstandingly against the unfortunately bleak prospects faced by most East Timorese women. The structure of the Co-op means that we all “aprende hamutuk, servisu hamutuk” (learn together, work together) and knowledge, resources and opportunities are shared; a philosophy that would serve any organization well. What we can teach them is less important than what we can learn from each other. The things I have learned from these women continue to gather. I will be unraveling these lessons from their tightly packed, earthily coloured balls for every day I continue to tread this unevenly spaced and unjustly spread world. They have given me understanding and insight into humanity and survival and kinship that first world society may never wholly understand. Mostly though, they have re-lit my faith in that little spark that exists in every culture and every society across the earth. The little pilot light that burns always and flares at invention and ingenuity. Sometimes ignored, sometimes dampened, but once ignited it grows and spreads and multiplies. A speck of creativity, sparking into wildfire.